Each Communication Passport is unique to each AAC user. Ideally, a totally personalised Communication Passport would be created for each individual but this can be very time-consuming. 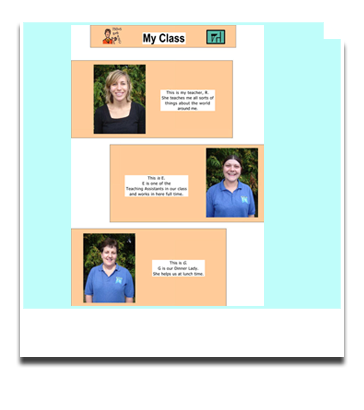 Using templates is less person-centred but is much more efficient. Prompts and suggested ideas about what to put on each page. Particular suggestions on how to present it. Avoid turning the production of Communication Passports into an 'assembly line' process using the same layout and graphics for all, and DO try to expand and personalise each one as much as possible. This text is abridged from CALL Scotland's Personal Communication Passports template text. As the AAC user develops, their preferences and abilities to use different techniques will change. It is paramount that a user’s Communication Passport is regularly reviewed and updated. As a SENCO/senior/head teacher, your role is to ensure that every AAC user's situation is monitored and recorded and that the Communication Passport is regularly updated. A young boy's Communication Passport, notes and photographs of his teachers. School staff – such as lunch time support staff. Other professionals – such as physiotherapists, occupational therapists and speech therapists. CALL Scotland have a range of Passport template and instructions. Take a look here. Scope also have Communication Passport templates. Sarah Millar pioneered Communication Passports and her website details a variety of tools and resources to develop and evaluate them. Find out more here. BILD have provided useful information on ‘All About Me Books’. Read about it here. Helen Sanderson, known for her work on person centered planning, writes about Communication Passports here. Back to What is a Communication Passport?